Costa Rica is famous for its thickly forested landscapes and rich coffee culture. 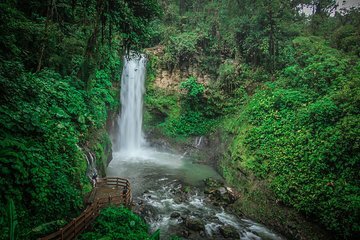 Experience both aspects on this day trip from San Jose, during which you can tour the Doka Coffee Estate, enjoy breakfast on the grounds, and hike through jungle in La Paz Waterfall Garden—stopping to see a massive cascade. In the garden, you can also visit family-friendly exhibits such as the butterfly garden, the serpentarium, and the hummingbird gallery.